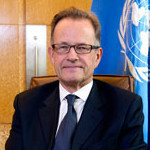 United Nations Secretary-General Ban Ki-moon announced on 5 November 2013 the appointment of Michael Møller of Denmark as Acting Head, United Nations Office at Geneva. Mr. Møller has served for more than 30 years as an international civil servant in the United Nations. Most recently he was Executive Director of the Kofi Annan Foundation from 2008 to 2011. Prior to this, he served as the Secretary-General’s Special Representative for Cyprus (2006-2008) and Director for Political, Peacekeeping and Humanitarian Affairs in the Office of the Secretary-General (2001-2006), also serving concurrently as Deputy Chief of Staff for the last two years of that period. Between 1997 and 2001 he was the Head of the Office of the Under-Secretary-General for Political Affairs at UN headquarters in New York. He served in different capacities in Iran, Mexico, Haiti and Geneva, where he started his career in 1979 with the United Nations High Commissioner for Refugees. Born in 1952 in Copenhagen, Mr. Møller completed a Master’s course in International Relations at Johns Hopkins University and a Bachelor’s degree in International Relations from the University of Sussex, United Kingdom.